In the article ‘Facebook loses attention as publishers shift focus to other platforms’, DigidayUK touches upon a new trend in online news publishing. According to the website, news publishers are slowly shifting to other social media platforms to distribute their news. Facebook is clearly still a big source of referral traffic for publishers overall, DigidayUK writes. But publishers are giving more attention to other platforms such as Google News, Apple News, Snapchat, and Instagram (owned by Facebook). Publishers who change their distributing are posting less on Facebook and when they do post, they make sure to refer people back to their websites. Also, publishers create more original content for specific platforms. In ‘The Cultural Logic of Media Convergence’ by Henry Jenkins of the Massachusetts Institute of Technology, Jenkins describes the emergence of media convergence. In the 2004 study he writes: “For the foreseeable future, convergence will be a kind of kludge – a jerry-rigged relationship between different media technologies – rather than a fully integrated system.” (Jenkins, 34). However thirteen years later I think we could argue that the various media technologie are deeply integrated with each other. Media are more and more intertwined nowadays but it is more of a dependency than a true cooperation. The absolute power of Facebook is showing some weaknesses as seen in the news article. If this trend continues, does that mean a potential change of the current media system? Or will another player take over the dominant position of Facebook? According to Jenkins consumers are expected to play a more active role in determining what content they want to see (Jenkins, 38). But I think the scholar didn’t spot the correct trend on this point. Consumers have little or no power what they see on dominant platforms like facebook. They are left to the will of an algorithm. Ajid Pai is a name few people outside of Washington D.C. have ever heard. But he is a bigger threat to journalism than Donald Trump. 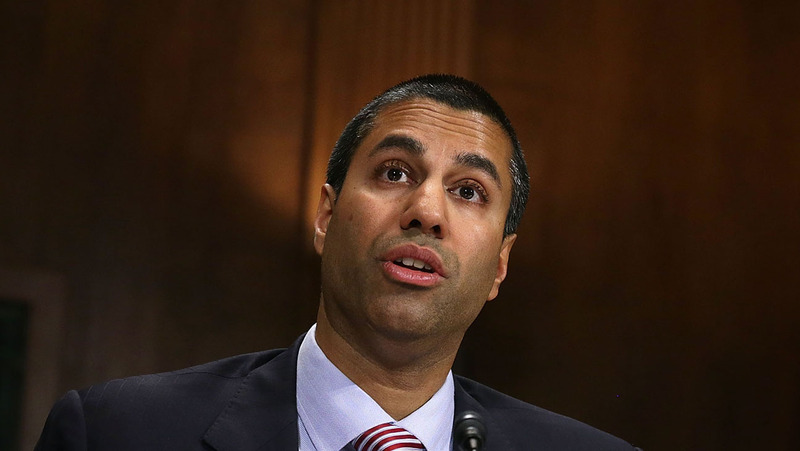 Ajit Pai is the incumbent Chairman of the Federal Communications Commission (FCC) handpicked by Trump for the position. On Monday the Senate reconfirmed his nomination as Chair, just as the FCC concludes their final review of the largest media merger in American history: a merger which wouldn’t have been possible 12 months ago. As discussed in Jenkins’ reading The Image and Role of Media Convergence, public concern surrounding the consolidation of media outlets have been steadily rising over the past decade . The pending $3.9 billion merger of Sinclair Broadcasting Group (a conservative news outlet with close ties to the President) and Tribune Media Company realizes this fear, by permitting Sinclair to expand its right-leaning television empire into 72% of American households . As we have seen time and time again over the course of Trump’s presidency, loyalty to his cause is met with high reward. Consequently, Pai revived a regulatory loophole that would allow Sinclair to “own a segment of the media landscape that would have previously exceeded [the national audience cap of 39 percent]” . Though the merger is technically still under review, its approval by the FCC is almost inevitable. And once the ink is dry, the Sinclair-Tribune merger promises to homogenize the information-diet of millions of Americans, leaving little room for ideological or economic competition. McGill, Margaret Harding, and John Hendel. “How Trump’s FCC aided Sinclair’s expansion.” Politico, Politico LLC, 8 Aug. 2017, www.salon.com/2017/08/07/fcc-exploits-loophole-to-push-massive-expansion-of-pro-trump-sinclair-broadcasting/. Article. Frankel, Todd C. “Sinclair Broadcast to buy Tribune Media for $3.9 billion, giving it control over 215 local TV stations.” The Washington Post, WP Company LLC, 8 May 2017, www.washingtonpost.com/news/business/wp/2017/05/08/sinclair-broadcast-to-buytribune-media-for-3-9-billion-creating-nations-largest-tv-station-group/?utm_term=.f286b6b4d851. Article. 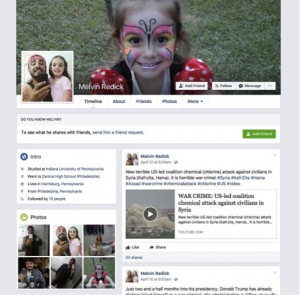 Fake American Facebook profiles made by Russian intelligence officials- we’ve heard it all before. But to whom belong the stolen faces used to promote Russian propaganda on the prominent social media platform? And what legal protection can be offered to the people whose photos are unknowingly used to give a human identity to this exploitative practice? Yesterday, the New York Times reported that 36-year-old Charles David Costacurta from Brazil has come forward saying that photos of him and his underage daughter were appropriated to create the fake profile of ‘Melvin Redick’. Redick was one of the countless ‘imposter profiles’ used and financed to funnel Russian propaganda into the conservative community on Facebook. According to Roy Caplan and Danah Boyd, “algorithms, as an object of study, unite a variety of information systems that are currently crucial to our participation in the public sphere.” By exploiting the algorithms sites such as Facebook use to customize the feeds of their global user base, Russian officials used the faces of people like Mr. Costacurta to create a relatable reference point in that algorithm. Shane, Scott. “Mystery of Russian Fake on Facebook Solved, by a Brazilian.” The New York Times, The New York Times Company, 13 Sept. 2017, www.nytimes.com/2017/09/13/us/politics/russia-facebookelection.html?hp&action=click&pgtype=Homepage&clickSource=storyheading&module=secondcolumn-region®ion=top-news&WT.nav=top-news. Article. Boyd, Danah, and Roy Caplan. “Who Controls the Public Sphere in an Era of Algorithms?” Data & Society, 13 May 2016, pp. 1-19. Barbosa, Claudio R., and Pedro Vilhena. “Data Protection in Brazil: Overview.” Thomson Reuters Practical Law, Thomson Reuters, 1 Jan. 2017, uk.practicallaw.thomsonreuters.com/4-520 1732?transitionType=Default&contextData=(sc.Default)&firstPage=true&bhcp=1. Dias, Carlos. “Morador de Jundiaí é o rosto de fotos roubadas por perfil falso usado para influenciar eleição nos EUA” [“Resident of Jundiaí is the face of photos stolen by false profile used to influence US election”]. G1, 13 Sept. 2017, g1.globo.com/sao-paulo/sorocaba-jundiai/noticia/morador-de-jundiai-e-o-rosto-de-fotos-roubadas-por-perfil-falso-usado-para-influenciar-eleicao-nos-eua.ghtml. Hoera! Online media platform Mindshakes bestond begin deze maand een jaar. Tijd voor een analyse. Mindshakes richt zich op millenials en het platform lijkt er alles aan te doen om die doelgroep te begrijpen en bereiken. De makers van het platform weten naar eigen zeggen dat het zó tien jaar geleden is om nog vanaf een computer naar een website te turen. Je vindt de artikelen vooral op social media, een goede strategie. Mindshakes gaat niet voor bereik, maar voor impact. Daar zit een mooie filosofie achter, maar hoe meet je zoiets? Het contentalgoritme hieronder lijkt nogal vaag. Gebruik maken van branded content hoeft echter helemaal niet zo verkeerd te zijn. Het geeft Mindshakes wel een inkomstenbron die ze de ruimte bied om te experimenteren. Daaraan draagt bij dat het platform eigenlijk een dochteronderneming van NRC is en met Ward Wijndelts heeft het medium veel ervaring in huis. De grootste bedreiging voor het platform vormt Vice. Vice richt zich ook op jongeren, maakt gebruik van kekke filmpjes en weet de doelgroep uitstekend te bereiken via social media. Wijndelts zegt dat Vice ‘meer van de sensatie’ is. Dat is inderdaad een onderscheid, maar deze pakt dan positief uit voor Vice. Want zijn jongeren vaak juist niet op zoek naar sensatie? Since journalism has moved onto the internet many concerns have been raised about subsidizing good journalism. Consumers are supposedly no longer willing to pay for content and advertising revenue for traditional news is rapidly declining. Like Van der Haak, I would also argue that this move to the internet is not a crisis, but an explosion of journalism. Journalistic start-ups are popping up everywhere. Start-ups like Oximity.com. 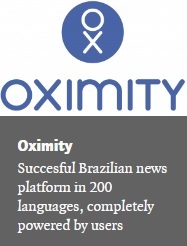 This Brazilian news platform that translates its news stories in over 200 languages, lets readers pay for their content, generating a built-in revenue system for the writers, through the amount of clicks on an article. The strong point of this website is that it creates content through crowd-sourcing, creating increasingly more data. The weakness here is that the writers are not journalists, which means the quality of the content is not guaranteed. The opportunities I see for this website are plenty. There are many ways in which this website can develop. Especially the translation feature could provide an opportunity for less politically tainted content. The threat of not having journalists on staff though, is that writers do not consider the impact of their articles. This could be disadvantageous. However, although a good start-up does not necessarily lead to success, I still have high hopes for this website. Anderson et al (2015), p.37. Anderson et al (2015), p. 35. Van der Haak (2012, p. 2924. Van der Haak (2012), p. 2923. Sirkkunen & Cook (2012), p. 119. Sirkkunen & Cook (2012), p. 111. Anderson et al (2015), p. 51. Van der Haak (2012), p. 2925. Anderson et al (2015), p. 52. Naldi & Picard (2012), p. 92. • Bell, Emily, C. W. Anderson, and Clay Shirky. “Post-Industrial Journalism: Adapting to the Present.” Geopolitics, History, and International Relations 2 (2015): 32–123. Print. • Van der Haak, Bregtje, Parks, Michael, and Manuel Castells. “The Future of Journalism: Networked Journalism.” International Journal of Communication 6 (2012): 2923–2938. Print. • Witschge, Tamara, and Gunnar Nygren. “Journalism: A Profession Under Pressure? Journal of Media Business Studies 6.1 (2009): 37-59. Web. 20 Aug. 2014. • Sirkkunen, Esa and Clare Cook. “Chasing Sustainability on the Net.” Tampere Research Centre for Media, Journalism and Communication, 2012: Chapter 1 Introduction; Chapter 4 Sustaining journalistic entrepreneurship; Chapter 5 Conclusions. Web. 19 Aug. 2014. • Naldi, Lucia, and Robert G. Picard. “‘Let’s Start an Online News site’: Opportunities, Resources, Strategy, and Formational Myopia in Startups.” Journal of Media Business Studies 4 (2012): 47-59. Web. 11 August 2015. Mediapart is een Franse online krant, opgericht in 2007 door Edwy Plenel (oud-hoofdredacteur van Le Monde), Laurent Mauduit (oud-eindredacteur Le Monde) en Gérard Despotes (oud-hoofdredacteur Libération). Mediapart wil een onafhankelijk online nieuwsplatform creëren, vrij van advertenties. Plenel, Mauduit en Despotes waren al gevestigde namen met een groot netwerk. Hierdoor had Mediapart vanaf het eerste moment een grote naamsbekendheid en achterban. Van der Haak, Parks en Catells (2012) stellen dat consumenten steeds minder bereid zijn te betalen voor nieuws. Met dit in het achterhoofd, is Mediapart een gewaagde keuze. Mediapart heeft wel een gedeeltelijk betaalmodel; de longreads, podcasts en we documentaires zitten achter een betaalmuur. Een volledig lidmaatschap kost 9 euro per maand. Mediapart heeft een aantal stukken in het Engels vertaald, maar dit zou nog verder uitgebreid kunnen worden om op die manier een groter publiek te trekken. Er zijn inmiddels steeds meer soortgelijke online nieuwsplatforms, waardoor concurrentie groeit. In Nederland zijn de Correspondent en Follow The Money voorbeelden hiervan. Van der Haak, Bregtje, Parks, Michael, and Manuel Castells. “The Future of Journalism: Networked Journalism.” International Journal of Communication 6 (2012): 2923–2938. ReadWrite is een technology blog zoals velen anderen. Het bestaat sinds 2003 en het is daarmee wellicht al zijn start up-fase ontgroeid. Desondanks gaat het niet goed met de website. Dan Lyons schrijft in zijn boek Disrupted kort over zijn ongelukkige tijd bij ReadWrite als editor in-chief. Op basis van zijn ervaringen heb ik deze SWOT-analyse opgesteld. ReadWrite is een gevestigde naam, daardoor hebben zij zichzelf al verzekerd van een bepaalde bezoekersstroom. Zoals Van der Haak, Parks en Castells terecht opmerken willen consumenten minder voor hun nieuws betalen. Daardoor zijn zoals ReadWrite vooral afhankelijk van adverteerders. Lyons was als editor in chief vooral bezig met het binnenhalen van adverteerders. Zoals andere blogs maakt ReadWrite nu ook gebruik van branded content. Gebruikers kijken steeds minder naar advertenties. Daarnaast hebben veel gebruikers een AdBlocker geïnstalleerd. Branded content gaat nu nog vaak door dit soort blockers heen, maar het is slechts een kwestie van tijd voordat dit soort content ook te irritant gevonden wordt. Sommigen denken dat de journalistiek in een crisis zit, Haak, Park & Castells (2012) stellen echter van niet; via internet liggen de mogelijkheden nog volop open. Een platform dat hier op inspeelt is LocalFocus. Het parool, nu.nl en de Volkskrant zijn enkele media die gebruik maken van het dataplatform om data te visualiseren. Het bedrijf, opgericht in 2013 wordt nog volop gebruikt; tijd voor een SWOT. De strength van LocalFocus is het dat het een voorloper op het gebied van datavisualisatie is. Daarnaast heeft de website al voor meerdere media datasets gemaakt, zoals de Volkskrant en het Parool. Hierdoor heeft het een naam opgebouwd. Het team van LocalFocus bestaat uit ontwikkelaars en datajournalisten. Er is geen medewerker met een bedrijfsachtergrond. Dit kan een weakness zijn bij de ontwikkeling van het bedrijf. De opportunities van LocalFocus zijn groot. Data, van bijvoorbeeld de overheid, ligt voor het oprapen. Datajournalistiek is opkomend en LocalFocus maakt deze cijferbrij begrijpelijk voor het grote publiek. En het is gratis, in tegenstelling tot andere visualisatie programma’s. Mindshakes is een website van jonge en creatieve filmmakers, art-directors, regisseurs en contentmakers. Hun gezamenlijke doel is mensen raken. Het is een bonte verzameling van multimediale content en de onderwerpen lopen uiteen van ‘mooie dingen’ tot zelfmoord. Een strenght van Mindshakes is het multimediale karakter, er zijn onder andere longreads, films, fotoseries en zelf strips. Je weet nooit wat je kunt verwachten bij een verhaal en dat maakt het een spannende site. Maar, er schuilt ook een weakness in het variabele karakter van Mindshakes. De consument weet nooit wanneer er een nieuw artikel wordt geplaatst en waar het over zal gaan. Dit zou ervoor kunnen zorgen dat ze afhaken. De opportunity ligt bij Mindshakes bij hun verdienmodel. Nu consumenten steeds minder geneigd zijn voor hun dagelijkse portie journalistiek te betalen (Van der Haak, Parks en Castells, 2012), moeten er andere manieren gevonden worden om geld in het laatje te krijgen. Mindshakes doet dit door ‘branded content’ aan te bieden aan adverteerders. Tot slot is de concurrentie de grootste threat van Mindshakes. Niet alleen van andere creatievelingen, maar ook van bedrijven die steeds meer tijd en geld in contentmarketing stoppen.